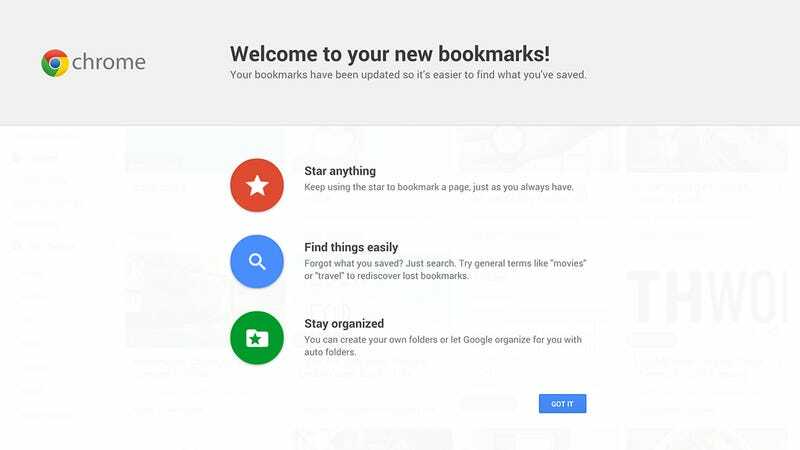 Google has launched a new way of managing your bookmarks, though it's been rolled out as a Chrome extension rather than a native browser feature. Here's what the new tool can do for you and your ever-expanding list of saved links. The extension sits on top of Chrome and jumps into action whenever you try and bookmark a site or organize your bookmarks, and it also takes over the Ctrl+D shortcut (Cmd+D on a Mac). Because it's just an extension, though, you can uninstall it and your bookmarks will reappear in the standard format. It doesn't wipe or edit the bookmarks you already have in Chrome, and the bookmarks bar stays in place (with a new link to all your bookmarks). So what's changed? Essentially your bookmarks have been given a new (Material Design-influenced) lick of paint. You can add and search through bookmarks as before, but in an interface that looks more like Pocket or Instapaper than a 1990s Netscape dialog. Search gets the ability to look inside the content of the bookmarked page as well as the title and description. The biggest difference you'll notice are the auto-folders that attempt to intelligently group your bookmarks into different categories (like "Movies" or "Google"). Manual folders can be created and edited as normal but there's no way of tweaking or managing your auto-folders for the time being. It wasn't particularly useful for us, but your mileage may vary. Also new is the ability to share a particular folder with the world at large. When you create a new folder with no parent folder, there's the option to make it Public from the dialog box. However, no matter what we tried, the Share this folder button remained disabled. It's possible that this feature isn't fully live yet, or that there was an issue with our version of Chrome. Your bookmarks will still be synced across multiple machines of course, and if you have set up the browser to sync your extensions then Bookmark Manager will pop up on all of the computers where you've got Chrome installed. If not, you'll still see the old bookmark interface when you're using the program elsewhere. It's not a huge step forward in the bookmarking experience, but the new look and smarter sorting features make it worth the upgrade.